"Simple and delicious. The key is tossing the spices with the potatoes and oil in a bowl and then on to the pan. The silicone mat we are baking on is a very nice thing to have in your kitchen." Preheat oven to 425 degrees F (220 degrees C). Line a baking sheet with a silicone baking mat. Toss potato wedges, olive oil, herbes de Provence, paprika, salt, and black pepper together in a bowl until potatoes are evenly coated. 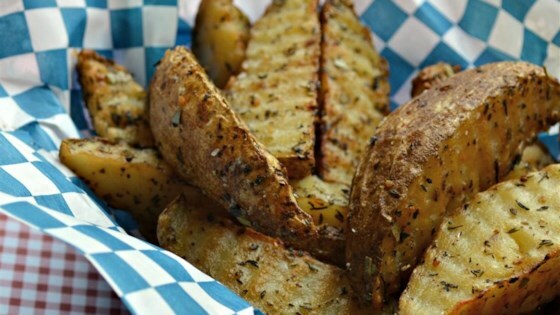 Place wedges on their sides onto the prepared baking sheet. I really did not care for the flavor. These are so good that they/ become staple in our house and they are so easy to make too!